Like sun? Like nature? Like outdoor sports? Like lesser-known destinations, and don’t mind a longer drive or figuring out some transportation options? Then consider Cabo de Gata, the southeast tip of Spain. Almost desert-dry, with the lowest rainfall in all of Europe, so your chances of warm, dry weather are pretty good most of the year, and there are things to do if the sun doesn’t shine during your entire stay. So exactly where is this? Between Mojácar (south-ish on Spain’s east coast), and Almeria city (east-ish on Spain’s south coast), and everything east of a line through Níjar connecting the two places – plus a bit north of that line (Sorbas and Tabernas). Cabo de Gata Natural Park: One of the main attractions of this area is the Cabo de Gata Natural park, declared in 1987. Thanks partly to park zoning, the coast between Mojácar and Almería has mostly escaped excessive development; farther back in time the lack of water also hindered development, so now you can enjoy a relatively pristine coast. “Relatively” pristine, as ironically, the park did bring some rather unfortunate building in urban areas, along with much needed money from increased tourism. Hopefully the park zoning and environmentalist interest will help guide the area’s development in the future. — Villages or man-made: Mojácar, charming white village on a hill overlooking the sea. Agua Amarga (south of Mojácar) and Cabo de Gata (south coast, east of Almeria), two old fishing villages, now developed but still with a bit of old flavor. Cabo de Gata lighthouse on southeasternmost tip, placement and view. Cabo de Gata saltpans, probably used in Roman times and still in operation; saltpans are between lighthouse and village. Almeria city, castle and Cathedral built on site of a 10th century mosque; can see bits of mosque but not as spectacular as Córdoba. Almeria city also has a museum with some archeological artifacts from the area, though the best pieces are in Madrid. — Nature: View from Mesa Roldan lookout. Rock formations, all along eastern coast but especially between San José and the lighthouse, in the sea and on the beaches. Crater of old volcano, northwest of Los Escullos. Flamingos and other bird life in salt pans near Cabo de Gata village. Sand dunes, especially Playa de los Genoveses. Best beaches: Monsul and Genoveses beaches near San Jose. Agua Amarga beach, small but nice, and beaches south of that village, some only accessible on foot at low tide. El Playazo, near Rodalquilar village. Cabo de Gata village beach is long but rather rocky. 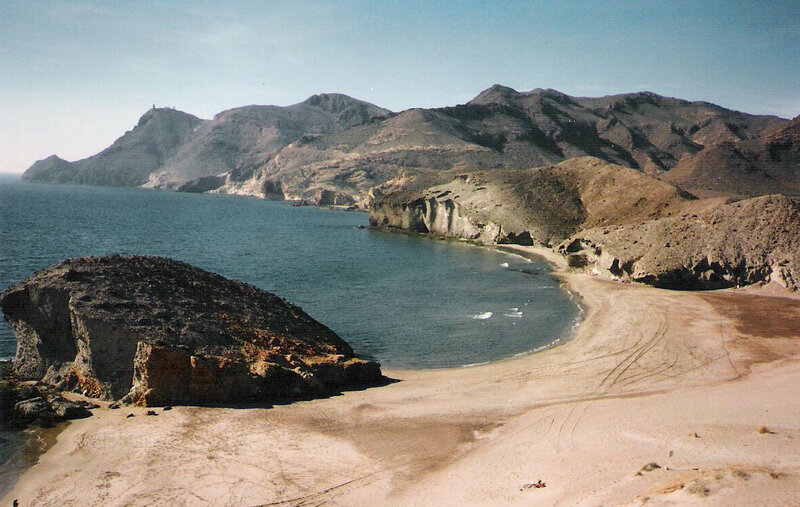 Some nice beaches near Carboneras (east coast) but nearby cement factory is a bit off-putting. Mojácar’s beaches are smallish and outside town. San Pedro nudist beach just north of Las Negras (nice walking path to get there, 40 minutes); this used to be a lovely, almost pristine beach but has some issues now –illegal bars, “alternative lifestyle” settlement that is not terribly respectful of the environment. — Villages or man-made: Near Tabernes: several US – Western town film sets remaining from the 1950-1970’s era of “paella westerns”, host to stars like Clint Eastwood, Brigitte Bardot, Harrison Ford, Raquel Welch and others. Nijar village, one of largest in the area and typical of inland Almeria. “Norias” or water-wheels to draw water for irrigation from underground, one of the best is in Pozo de los Frailes. Abandoned gold mines near Rodalquilar. Cortijo del Fraile ruins near Rodalquilar, site of the events described in Federico Garcia Lorca’s tragedy Bodas de Sangre (Blood Wedding). Archaeological sites (prehistoric and Roman), interesting for history buffs. — Nature: Tabernas desert, limestone “karst” formations around Sorbas: at least Aguas and Covadura caves, also some gorges so narrow they look like caves. Environment / sports: There are lots of opportunities for activities in nature (diving, kayaking, hiking, cycling, horseback riding, caving in Sorbas) BUT please remember this is a natural park in a fragile environment, with permit requirements or restrictions for some activities. As always, leave no litter, and if you see any left by less considerate visitors, perhaps you could do a good deed and pick it up. Information on active travel companies in links below. Shopping: Traditional crafts include ceramics (often cream and blue, some greens and grays). Rag rugs called “jarapas”: these rugs were often used on beds to protect the bedspread. Woven grass mats and baskets. “Indalo” fertility goddess symbol, a stylized stick figure with outspread arms. Good places for shopping: Níjar, Sorbas, Mojácar, San José. When to go: October – May, with early June and late September a possibility though with higher temperatures. I have swum in the ocean in December (and don’t consider myself especially fond of cold water). BUT….. If it rains, it (usually) pours: Yes, this is the driest part of Europe, but when it rains, it is often a downpour that can cause flash floods. Notice the number of no-bridge stream crossings, where minor paved or unpaved roads dip down over a gully. Heavy rains can and do fill these empty gullies with roaring rivers (hard to believe but true). If that happens, do not try to drive across what was yesterday a dry gully. Ask locals about alternative routes, or even better, ask local police or Guardia Civil; they’ll be in charge of any rescue operations so give them a chance to stop the rescue situation before it happens. Best villages to stay: Mojacar, Agua Amarga, Las Negras, Rodalquilar (a little inland), San Jose, Cabo de Gata all have hotels of different styles and prices. How to get there: By car: Fastest but less scenic: southeast to Murcia, then south through Lorca; this is the best route if you plan to stay in Mojácar or Agua Amarga. Most scenic, more challenging driving: to Granada then south through Sierra Nevada and southeast to Almeria through the Alpujarra mountains on smaller roads (several possible routes). Other transportation: Almería station is centralized for train and bus. Madrid – Almeria is a very long trip, so direct bus not a good idea, but Alsa buses run from Jaen, Granada, Sevilla and Malaga. Renfe has direct Madrid – Almeria train service, usually one or two trains a day, sometimes more April-September (www.renfe.es); alas, the convenient night train seems to have disappeared. Almeria does have an airport, and flights may be cheaper than the train. Many towns in this area are connected to Almeria by bus, so if you don’t plan to move around much, public transportation is possible. And last but definitely not least, that question you may be asking yourself: Why is this called Cape Girl-kitty? And the answer is: the name doesn’t come from “cat” but from “agate” (semi-precious stone) that used to be found along the coast. And yes, if you know your rocks and you’re really lucky, you still might find an agate or two. Websites for more information / pre-trip planning: English version not always available or complete. http://www.museosdeandalucia.es/cultura/museos/MAL/ Website for Almeria Archaeological museum. https://www.turismodealmeria.org/prepara-tu-viaje/como-llegar/ Some info on bus lines in the province of Almeria. Highway AL-3115, Tramo Retamar-Pujaire Km. 7.